Our new e-book, Small Nonprofits, Big Impact is a must read for nonprofit professionals trying to do more with less, or leaders of small but mighty nonprofits focusing their nonprofit technology investments in 2018. We’ve packed new case studies, tips, and tech hacks into one neat package that share how customer’s implement nonprofit CRM, fundraising, marketing, programs, and collaboration software. 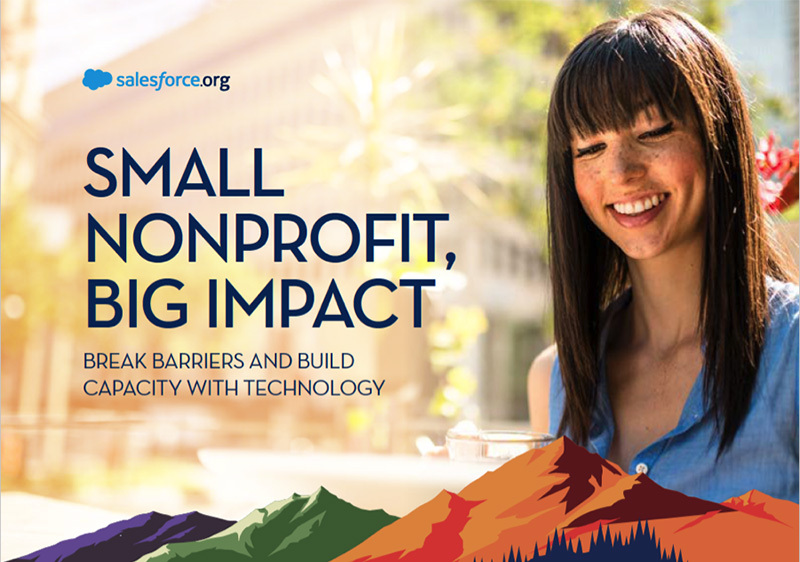 Click through to learn how Reclaim New York, Camp Kesem, Open Door Legal, and other customers have used Salesforce tools go big on impact with a small team. Whether you are an Executive Director, tech staff, development professionals, marketing guru, or programs person, there’s a section for you. So, fill out the short form and learn more, this ebook can be read while riding the bus or doing the laundry, and is full ‘o timesaving suggestions.